driver they want into Ferrari. with one extra driver but knowing Ferrari's appreciation for Kimi I don't think it's Kimi who leaves Ferrari. hearing with Renault and who knows which people get stained. If Alonso won the race through a dirty game then the driver gets quite a lot of stain too. In those proportions even one stain is never good for a driver. That could also change things in these final games. " Q: How well do you know Kimi and Heikki? be there and share both joys and sorrows. motorsport' as the boys say when things are bad. Heikki is very open and gets along with everyone, Heikki is what you see. Everybody likes him and it's really easy to get along with him. He is a joking and a fun guy. answers unemotionally saying 'I don't know, let's see, I'll do my best, let's see how far it takes' - these typical answers. But then occasionally when everything falls in place, like in Monza, it was surprising to see how the feeling comes out even on the podium, you saw that the man was as happy as a man can be, that's Kimi's real nature. His inner being is his strenght since no matter what result he gets he doesn't change like a rollercoaster. Kimi can control himself. 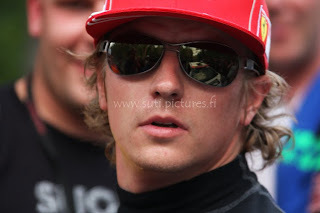 Of course a bad result hurts but Kimi is the only sportsman I know who can get really fast over disappointment. It takes about 15-30 minutes, after that the thoughts are completely in what is ahead. Kimi has a good philosophy 'Why worry about it when it doesn't change the result' - that's a philosophy that would suit any sportsman.